Face off against a rival general in Ancient Greece. Gauge your enemy's strengths and weaknesses...anticipate his or her plans...and send your forces forth to take control of the battlefield! Only the most cunning military mind can win the day! Reiner Knizia's acclaimed card game is now an officially licensed, universal iOs App for your iPhone, iPod Touch, or iPad! Now you can HOLD the BATTLELINE! Version 3.1 now available! Play ONLINE vs opponents from around the world on any model of iPad, iPod Touch, iPhone or any computer! Strive to earn 19 Game Center achievements! Full Game Center integration allows you to invite your friends on Game Center to a live or turn based game! BATTLELINE, the acclaimed card-based strategy game from world-reknowned game designer Reiner Knizia, is one of Boardgamegeek.com's Top 100 Board Games of All Time, and one of the Top 50 Strategy Games of All Time. GOURMET GAMING is proud to present BATTLELINE with gorgeous High Definition graphics, two different computer-controlled opponents, and basic and advanced rulesets for new and experienced players. 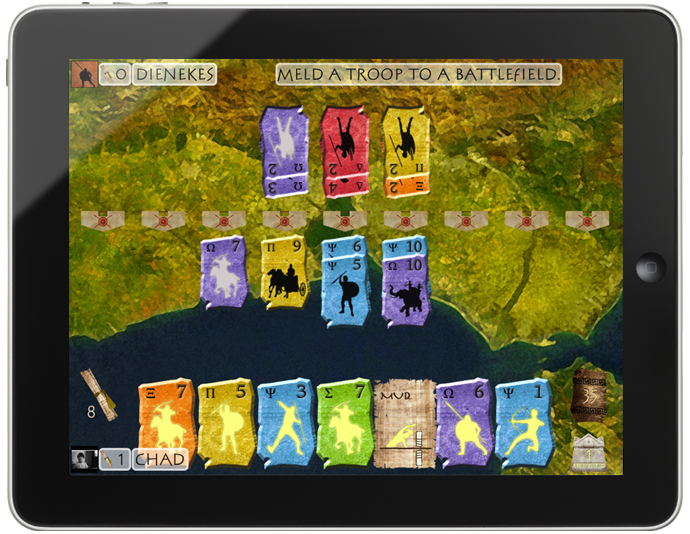 BATTLELINE is a strategy game that is easy to learn, but difficult to master. Every game presents a new and unique challenge that will keep you thinking and have you coming back for more!